Do you want to learn how to gain muscle mass fast for skinny guys? In this post I’ll talk about the importance of eating at a surplus, challenging yourself, compound lifts and supplements. The amount of calories you need to build muscle must be above maintenance. For example if you need 2000 calories a day to maintain your current body weight, you’ll need to eat at least 2250 to put on muscle. Ok so if I need to eat a lot can I eat whatever I want? No, I suggest you get your calories from lots of healthy nutritious clean food. You’ll be surprised at how large the serving sizes are for clean foods. For example, one serving of brown rice is 50 grams. Also, one serving of spinach is 89 grams. THAT’S A LOT OF SPINACH. Don’t shy away from carbohydrates and fats. For one, sweet potatoes, brown rice, and black beans are excellent muscle building foods. And healthy fats like olive and coconut oil have many nutrients your body needs. Don’t fret about having a small snack during the day. To be honest as long as you eat within your caloric needs you’ll be fine. As long as you aim to get 95% of your food from wholesome nutritious sources. Foods like chicken, tuna, quinoa, rice turkey and eggs should form the basis of your diet. Another thing to remember is to get 1 gram of protein per body weight a day. We need protein to build lean muscle so you must give your body enough to recover from workouts. The first way to do this is to eat some of the foods I’ve mentioned above mainly chicken, turkey eggs and beef. The second way to reach your protein needs is using protein shakes. Protein shakes are excellent for building muscle. First off they’re easy to make and consume. Simply add protein powder, a simple carb (I like bananas and dates) and water or milk and mix using a blender. And drinking a delicious shake is easier than eating 8 ounces of chicken. Secondly, protein shakes provide your body with quick acting amino acids. After working out your body needs protein fast and a whey protein shake is perfect for the job. This means overcoming fears inside and outside the gym. You’ll have to constantly challenge your body. First off that means progressively increasing the weight you lift. The more you can lift the stronger you’ll become and the more muscle mass you put on. As long as you can keep good form don’t fear putting weight on the bar and trying to knock out some reps.
Another way you’ll be challenged is daily problems in your life. Don’t let these problems knock you off track and make you skip workouts or screw up your eating habits. You’ll have to stay strong mentally and commit to reaching your goals. Learn to jump over hurdles. Make sure to learn how to properly perform every exercise. Not lifting correctly will put you at greater risk for injury. Watch videos on YouTube or Bodybuilding.com that show how to perform the various compound lifts. You want to make compound exercises the core of your workouts. First off, they target multiple muscle groups at once making it easy to pack on more muscle. Secondly, you’ll get much stronger. Shoot for 3 sets of 4-6 reps for each exercise in your workout. You can also learn how to build muscle from home. Don’t get caught in the supplements hype. It’s easy to waste lots of money on things you don’t really need . For one, many of the supplements out there are made just to make the product owner rich. There are a few reputable sources but the majority are in it just for the money. That being said they don’t care what you take in as long as it makes them a profit. They’ll use all types of marketing hype to make you believe you need their products when in actuality, you don’t. Remember the supplement industry is not governed by the FDA so be really careful as to what you put in your body. Last but not least, stay consistent! It takes time to become bigger and stronger. Our bodies are not designed to make massive change in a short period of time. Rather the best approach is to take things slow and steady. Get ahead step by step until you reach your goals. Be courageous and say no to distractions. If something or someone isn’t helping you towards your goals, stay away from them. And whatever you do, don’t quit. You can do this! In summary we discussed the importance of eating at a surplus, challenging yourself, compound lifts and supplements. I hope this post was about how to gain muscle mass fast for skinny guys was helpful. I have known several skinny friends who managed to transform into husky guys. I always asked them whats the trick and there are no two ways about it. It takes dedication and discipline. You have to plan your meals well, you need a lot of good calories and not junk ones like KFC fried chicken. Hitting the gym is a routine ritual, it is not an option to get bigger! Supplement definitely does aid and you must really research and find out which supplement can aid you in the transformation most! I completely agree. Putting on muscle requires tons of dediciatoin of discipline and most importantly patience! When I first started I felt discouraged when I didn’t see results for a few months not knowing it takes years of consistent action to get noticeable results. 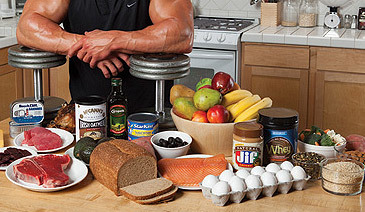 Love your post on how to gain muscle mass. As you are saying, you should get something like 250 calories above your maintenance to gain muscle. I think this is such an important point that many people get wrong. But 250 calories is much less than they think haha. I used to think I had to eat like a madman to gain weight. 250 is not a lot of calories at all.